18K Rose Gold case 44.2mm. Black Dial with Embossed raised Rose Gold Arabic Numeral hour markers & dot minute markers. Fixed 18K yellow gold bezel. Elegant leaf shaped polished rose gold hands. 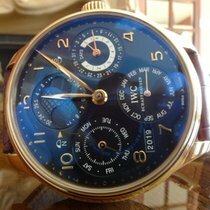 Perpetual Calendar with year display: Day of the week indicated on the outside perimeter of the sub-dial at the 9 o'clock position. Date indicated on the outside perimeter of the sub-dial at the 3 o'clock position. Month indicated at the sub-dial at the 6 o'clock position. Current year displayed in a full 4 digit format with a window between the 7 & 8 o'clock position. 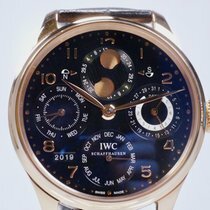 Moon-phase: Displayed at sub-dial at the 12 o'clock position. 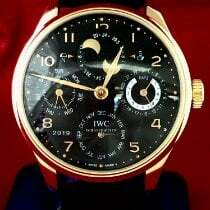 Indicated by a brushed rose gold coloured & black coloured disc which rotates beneath two windows on the dial. Automatic movement with 7 day power reserve. Scratch resistant sapphire crystal glass. Exhibition case back. Black Alligator strap with an 18K Rose Gold deployment buckle. Water resistant to 30 meters / 100 feet.